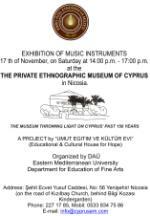 There will be continuous events taking place at the new most exciting museum. Do either watch this website or contact the museum directly. For the coming weekend there is a very interesting project, but please read yourself on the poster; click to enlarge! 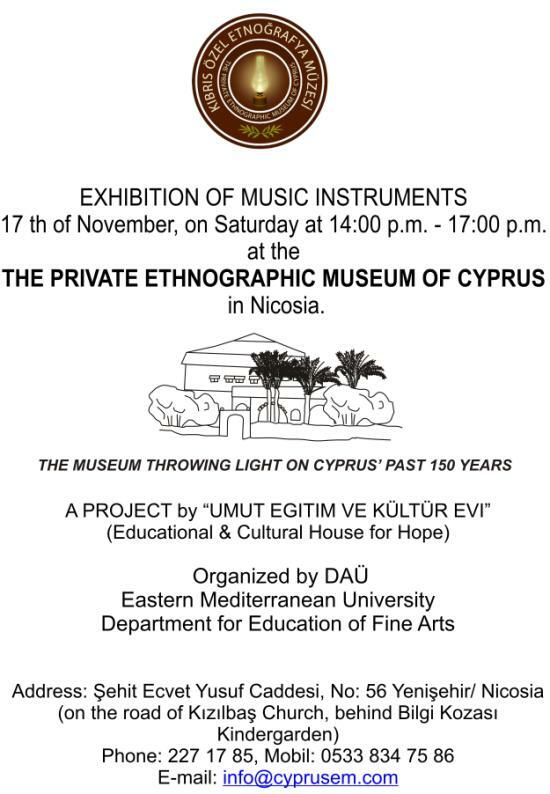 “The Private Ethnographic Museum of Cyprus” Adres: 56 Sehit Ecvet Yusuf Cad., Yenisehir/Nicosia Tuesday to Sunday with guided tours in Turkish and English Opening Hours: 9:30 – 16:00 For Information: info@cyprusem.com Tel. : 22 7 17 85 Mobil: 0533 834 75 86 Directions: Coming from Girne turn left in direction of Famagusta; at the second traffic light (on the left hand side is the green Alpet Petrol Station) turn right; pass the big church in the middle of the round about and after about 500 m left is a school and kindergarden, turn into this small road; behind the school is the big parking space and the museum; there is a sign.